Interesting, flavorful, well prepared dishes. I really like the 'menu du chef', where each day the chef decides what to cook, given the best available, fresh ingredients. No pretenses, excellent and original cooking. Looking forward to my next visit! There was a warm welcome. The waitresses were quite caring. Surprise menu is a real surprise, you do not know what will come and when the course comes, the waitress explains the details of the meal. The atmosphere was quiet, romantic and authentic. Definitely worth for such a surprise menu, that you would experience different kinds of food. Moreover, the time interval between the courses is a bit longer than you would expect; however, with the atmosphere and concept, it is just the right amount of time to talk to you partner. In short, well done! Starter reached the level of barely acceptable. Wines?? Three Euro supermarket wine on the list for 26 Euro. And then the main course, quail which was still raw on the bone. Finally, without any advanced notice, a 2 Euro supplement for three small pieces of cheap supermarket quality cheese. I know, it is only two Euro, but it is all part of their "surprise menu". Staff showed no understanding for our justified complaints. Many, really many restaurants in the city that are worth visiting. Not this one. We will never come back!!!!! This is a lovely restaurant. The concept has been described in previous postings so I won't repeat it. Just to say the food was delicious - every course, the service charming and prompt and the ambience delightful. We were on a road trip and we decided to have dinner that night somewhere in Utrecht. After 3 refused attempts (because everything was fully booked) we managed to reserve a table at C'est ça! We had no references, nothing that would drag us there, but it was a wonderful surprise. The menu is amazing and we had an amazing dinner. Thanks for such a nice welcome. We loved everything! There are few restaurants that deliver an actual culinary experience. This may well be the best place I've ever eaten. The 5 course meal and wine pairing took us on a trip we'll remember. We've become loyal customers. Absolutely spectacular experience! The surprise menu was delicious, the service was perfectly timed, and the atmosphere was warm and welcoming. It’s a hike from downtown, but well worth it. Make it a “must” on your next visit to Utrecht! What a wonderful surprise this out of the way restaurant is! No menu, just a very good chef making fresh, delicious dishes. Our main course of Sea Bream was excellent, as was the soup. Would not hesitate to recommend and visit again when back in Utrecht! Lovely quaint small restaurant, excellent “surprise” set menu, friendly attentive service. Very nice atmosphere; food was goood, but nothing spectacular, portions rather small. service was too long (more than 2 hours for 5 dishes), which really annoyed us. Excellent food, very pleasant and welcoming staff and very good value for money. Would definitely visit again. By far my favorite place in Utrecht, always a pleasure to come back or make it discover to new people. 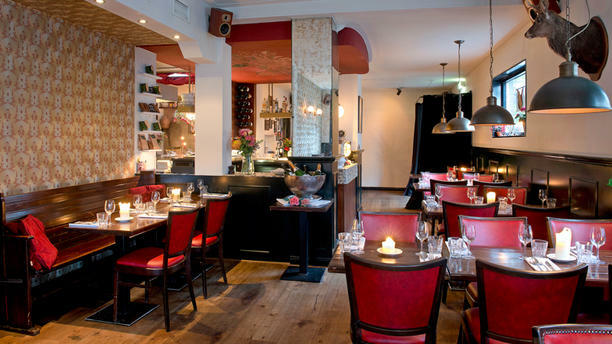 Cosy atmosphere, never the same menu, very good wines, and most of all waiters actually know what they are selling.